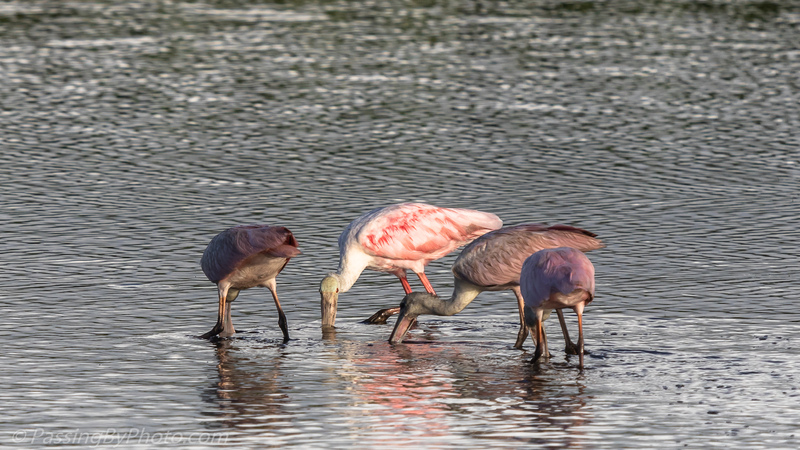 Roseate Spoonbills are fascinating to watch feed as they sift through the water with their beaks, their bodies in constant motion. There were about 30 Spoonbills scattered through this pond, sometimes together as a big group and then a few would go off on their own, following the food. 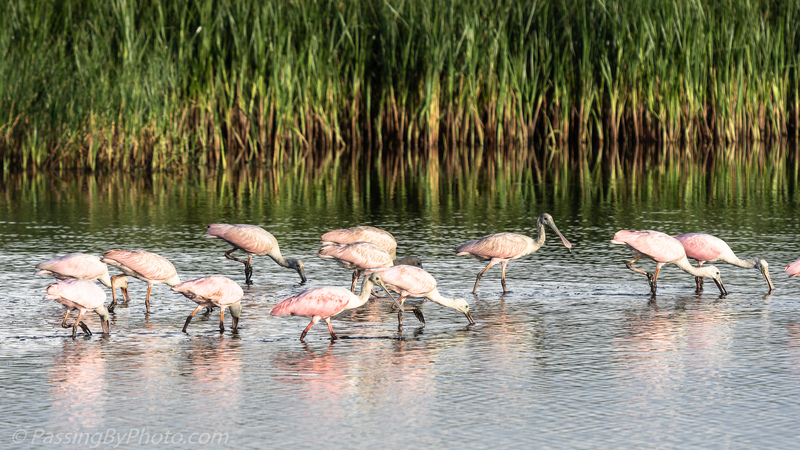 Getting a group photo is a challenge as they shift and turn, beaks in and out of the water. These were taken about an hour after daybreak as the sun finally made it up out of the clouds. Bear Island WMA, SC, 7/1/2018. These spectacular birds are definitely on my must-see list, though I know that I have to travel further south to do so. I appreciate the challenge of getting group shots–it’s hard to get a single one to assume a good pose. I especially love the delicate pink reflections in the final image. If you wait long enough they may come to you Mike! They are slowing working their way north. Anecdotally from photographer friends, 5 or 6 years ago they were almost never seen in SC, now they are regularly at least as far north as Myrtle Beach in spring/summer/fall. There were a few in the area of these photos, just below Charleston, all winter. Of course there is nothing wrong with a good trip south to see them and other gorgeous wading birds. LOL, but what a treat when we do get them lined up just so! Very nice! The colour and reflections in the second photo are really lovely. Thank you, Belinda! That pink still amazes me. Thanks, Donna, it was a lot of fun. We are going back in the morning to see if they are still there. The wildlife management folks change the water levels in these ponds off and on which affects their choice of feeding spots. Based on more sightings here I would not be surprised for you to get more. They seem to be working their way north. Environmental pressures, including reduced habitat in Florida seem to be in play from what I have read. These are very interesting and beautiful photographs! Yes, it’s a challenge to get a group photo of birds and you did an excellent job with wonderful reflections. Thank you, Kaya, glad that you enjoyed them. Thanks for stopping by!